A few weeks ago, I asked what Christmas shopping you guys needed help with and almost all the replies said two things: the boys in your life & a gift guide for your in-laws. You guys know I’m always here for you!! 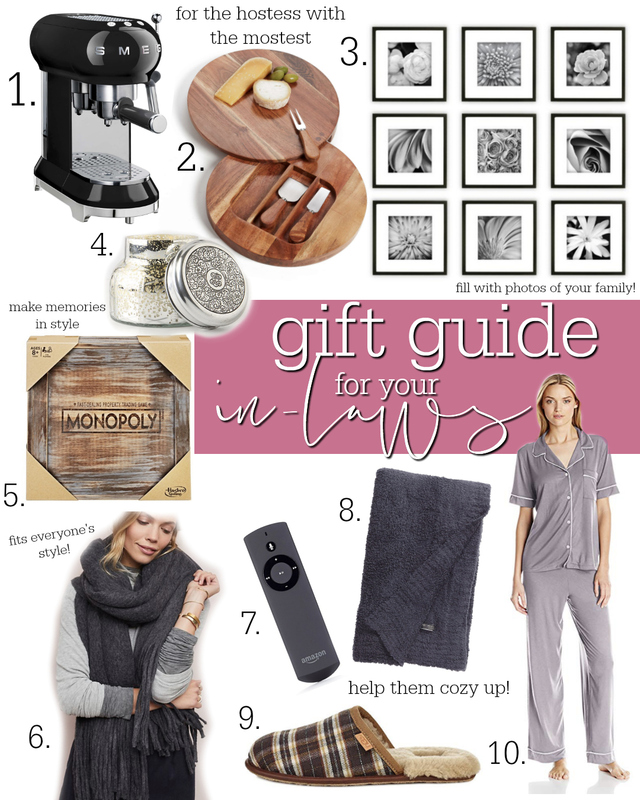 Today I’m sharing fun, cozy, memorable gifts that will make you the favorite daughter-in-law in the land. A few of these are more of splurges, but we all know our parents deserve it! 1. Retro Style Espresso Maker ($449) // Definitely a splurge but if you want a big gift this is such a fun and stylish piece! 2. Wood Cheese Board and Knives ($49) // If your in-laws love to host, this is perfect for them! They’ll think of you everytime they have guests over and will love how chic and functional this piece is. Pair with local cheeses or jam from your city if you’re traveling to them. 3. 9 Piece Gallery Wall ($52) // I know my parents are always asking for photos of us and this is the perfect gift that fulfills that wish without being your typical picture frame. You could even go in with other siblings to fill it with your entire family. 4. Capri Blue Volcano Candle ($24) // The holy grail of candles! I’ve never met someone who doesn’t love this candle. Need a small gift? Pair this with their favorite bottle of wine and you’re all set. 5. Rustic Series Monopoly Game ($39) // I feel like parents always love an interactive gift, especially if it’s something you can do as a family. This monopoly game is both attractive and fun! A win-win. 6. Cozy Blanket Scarf (5 colors, $48) // I know I share this scarf a lot but it’s incredible. It fits everyone’s style and you don’t have to worry about sizing! This scarf is so large and cozy, it also doubles as a poncho and wrap. It truly is the best scarf ever. 7. Fire TV Stick with Voice Remote ($39) // You could easily make this a fun date night gift basket! Throw in some of their favorite candy and snacks, some wine or beer and a blanket to have a gift that is a total win! 8. Barefoot Dreams Cozy Throw ($147) // Speaking of blankets, you already know this one is my FAVORITE. Yes, it is a splurge but it is truly the softest and coziest blanket ever. Even RJ asked for one last Christmas because he was so obsessed with mine. 9. UGG Plaid Slipper ($99) // Parents deserve all the pampering right?! UGG Slippers are so soft, any dad would love to wear these. 10. Eberjay Pajamas ($98) // Yes a little more than typical PJs but these are 100% worth it. Such high quality, soft and perfect for the mama you know deserves them! Fall Front Porch + Weatherproofing Any Fabric!